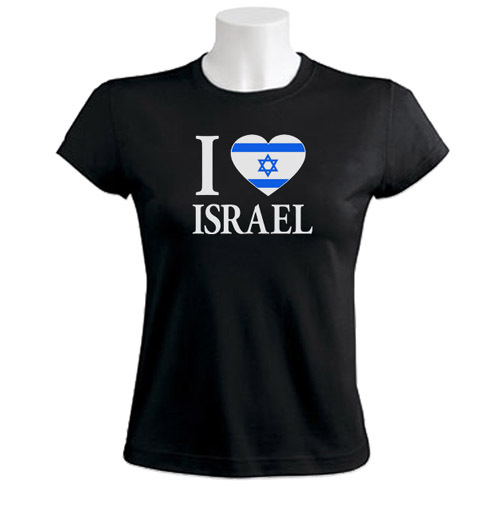 Women's tee with Israeli flag heart bears the popular ''I [Heart] Love Israel'' slogan. 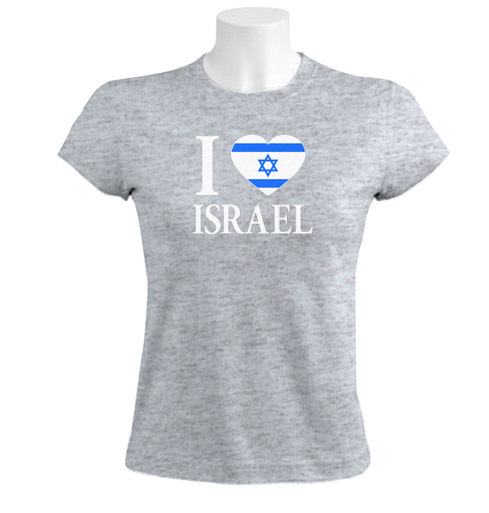 Proclaim your love for Israel with this women's Israel T-shirt. 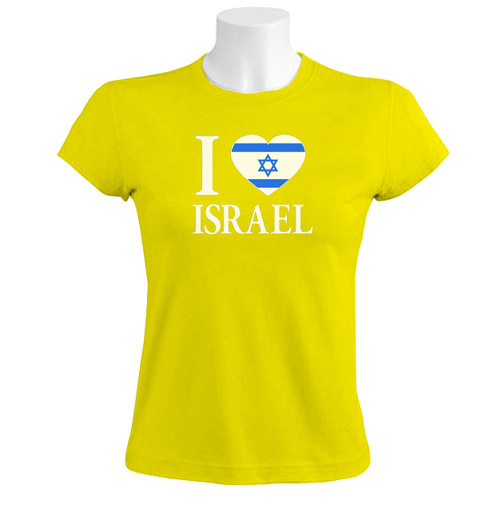 Cotton tee features the ever-popular 'I [heart] Love Israel' slogan that has been a hit for years. In this design, the 'Love' is rendered by a heart emblazoned with the Star of David and blue stripes of Israel's flag. The words are printed in white in a serif font for an elegant look. Women's tee is fitted with quarter-length sleeves. Customers can purchase this style in any of five colors: black, heather gray, turquoise, royal blue, or bright yellow. Israel T-shirts have been popular souvenirs and gifts for years. Visitors to Israel keep them as keepsakes, and bring them to friends and family as a way of sharing a bit of the Israel experience. Our T-shirts include designs that touch on all aspects of Israel and Israeli culture, especially military and security-related motifs. Our collection features the popular IDF T-shirts, as well as shirts with Mossad, Special Forces, and Israel Air Force designs. These fine preshrunk T-shirts are manufactured from 100% cotton, ring spun. The cotton is of an unusually high quality and extremely soft, so our T-shirt fabric is a little bit more expensive than other kinds. We want to guarantee that our customers completely satisfied with our products, so we insist on using the best-quality materials. Note: Even preshrunk 100% cotton tees can shrink up to one full size when washed. Please follow the laundry instructions on the shirt label.